As state and local government agencies turn to a growing number of online applications to deliver mission-critical services, many are confronting additional challenges in managing and securing the identity of citizens using those services. But the state of Texas is overcoming those challenges by integrating a centralized identity and access management, or IAM, platform, according to a new report. The Texas.gov website is a resource center for residents seeking information and applying for licenses and other state services. But with different login credentials for each service, agency leaders realized that an IAM solution could minimize the risks and drawbacks in the siloed system. The report, “Embracing IAM for better citizen experiences,” produced by StateScoop and underwritten by ForgeRock, details the steps Texas IT leaders and their partners at Deloitte are taking are taking to roll out an IAM platform as part of a larger initiative to modernize the state’s IT systems. Previously, Texas residents would access the state’s website to find information on services such as driver’s, hunting and professional licenses. But to engage in each service, users had to enter information individually and each service had its own data requirements. The Texas Department of Information Resources modernized the website and integrated an IAM platform to act as a single sign-on service for users to view all the information pertinent to them, the report explains. Once citizens created a user account on Texas.gov, the account would then manage access to the website’s affiliated services. To create the IAM platform, Deloitte reached out to experts at ForgeRock. “Centralizing the IAM capability and rerouting from each [citizen service] application through the single platform improves citizen experience, security and implementation times for all application owners,” said Jeff Brooks, vice president of U.S. public sector at ForgeRock. According to Keel, the team took about two months to stand up the first application, the first of 52 applications affiliated with the portal. Now with the first application completed, they estimate it will take the team just a few weeks to link each subsequent application or service to the new centralized IAM platform. Pick a systems integrator that understands IAM and your agency’s mission needs. 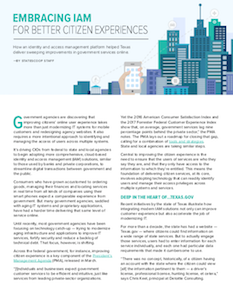 Read the special report “Embracing IAM for better citizen experiences,” and find out more about how IAM solutions can improve user experience to websites. This article was produced by StateScoop for, and sponsored by, ForgeRock.